SNK has delivered a launch gift to Wii owners with Metal Slug Anthology, a complete collection of the legendary Neo Geo series. The compilation includes all seven commercially released arcade games in perfect emulated form along with extra features and art galleries. The games play exactly as you'd expect them to, though the Wii controllers make an interesting twist on the formula. It takes some getting used to these changes, but options like using a Gamecube controller, means classic gamers won't be left out. These gimmicks aside, the Metal Slug titles remain as addictive and enjoyable as ever, with flawless translations and brilliant play. After more than a decade thrilling the hard-core Neo-Geo crowd, Metal Slug has finally arrived in style for the mass market. One of the most legendary side-scrolling series has finally offered the collection it deserves with the release of Metal Slug Anthology for the Nintendo Wii. Containing all seven arcade titles, (Metal Slug 1-7 plus Metal Slug X) this release includes every single Metal Slug title reproduced perfectly thanks to the wonders of arcade emulation. The gameplay doesn't need much explanation; you run and shoot at enemies, collect power-ups, face off against massive bosses and rescue any hostages you encounter along the way. In addition, each game includes a number of Slugs, or vehicles which you can jump into to increase your firepower. These Metal Slugs take different forms including tanks, camels, jet packs, helicopters and other clever inventions. Each of these has a different feel to it and gives you an additional set of weapons to use. In addition to your standard shots, you have bombs or grenades that you can fling at enemies and boss characters. These can also be used to break through walls or massive objects, so you need to save them. Before you begin each game, you select which of the characters you want to use, some of them run faster, while others seem to have more accurate aim. The number of characters available varies from game to game, and range from four in the first title to seven or eight in the latest release. From a gameplay standpoint, all the Metal Slug titles are quite enjoyable with the earlier games offering simpler structures and more straightforward layouts. The latter games offer more complicated level designs with multiple paths and more power-ups. Some of these stages contain enemies that will fire shots at you, causing your character to be transformed into a usually slower and less powerful character. These are funny at first, but can become frustrating later on as they can impede your progress. Metal Slug seems to have developed a winning formula over the years, and most of the games in the Anthology don't diverge too far from established norms, mostly tweaking and refining the basic elements of previous games. There are some surprises along the way, with off balance humor and strangely perverse level designs, but the basic rhythm and flow established in the first game remains intact. This remarkable level of consistency between the games makes this an even more enjoyable package for fans of the arcade titles. The intuitive controls and straightforward interface of these classic games means players can spend hours between each title, mastering the intricacies and nuances of the games without having to commit to long play sessions. The game's pick up and play mechanics makes Metal Slug Anthology instantly accessible, but the level of difficulty becomes more apparent as you delve deeper into the games and their later levels. This is a classic approach to gaming that fits in well with the Wii's philosophy, and makes the game feel right at home on the console. From a visual standpoint, the games look almost exactly the same as their arcade counterparts, with all the smooth animation, brilliant sprite, sense of humor and lush backgrounds that the series has become famous for. While the basic look doesn't change from game to game, players will notice a few evolutions such as semi-3D effects here and there, but the basics don't change much. The games' sound is fairly consistent as well and players looking for elaborate cut-scenes won't find them here. From a technical standpoint, the games' emulation is nearly flawless with the biggest difference loading screens that interrupt but don't change the feel of the action substantially. 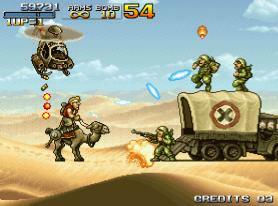 Metal Slug Anthology takes advantage of the Wii's unique controller by offering several configurations, most of which have you controlling movement and basic firing with the standard controller and using the nun-chuck attachment to throw grenades. A simpler approach using just the main Wii remote is also available, which works surprisingly well. Players who want a more traditional gaming experience can also plug in an old Gamecube controller and play the game using the standard face buttons exclusively with no shaking. We found this the best approach when you really want to play the game, since the process of shaking the controller to throw grenades quickly wears out its welcome, becoming more nuisance than novelty in a hurry. Disappointingly, the Wii's Classic Controller attachment isn't supported in this game, which is a real shame since it would have worked nicely with Anthology. It's definitely a mixed bag with the somewhat disappointing controls, but the sheer number of titles available and the high quality presentation, complete with extra artwork and music, more than makes up for it. While previous commercial Metal Slug compilations have included only one or two games at a time, this one offers a complete set of the games in flawless emulated form with little compromise as to gameplay quality or completeness. In the end, what matters most is the fact that Metal Slug Anthology delivers seven super arcade games in one convenient package with the addictive play mechanics, smooth animation and challenging boss battles the series has become known for. While there are some minor control issues, these problems are minor when compared to how much entertainment value is contained within. Metal Slug Anthology is a superb package containing a complete set of classic games and is highly recommended to arcade fans.